Aim: Limited clinical and angiographic data exists for patients with traumatic cervico-cerebral pseudoaneurysms. In this paper, we present our limited experience with various management strategies for traumatic cervico-cranial pseudoaneurysms. Materials and Methods: We retrospectively analyzed 37 consecutive cases of traumatic pseudoaneurysms involving the cervico-cranial or the cerebral arteries diagnosed at our center from September 2009 to December 2014. The demographic data, etiology, clinical presentation, lesion location, treatment modality, and follow-up outcomes of these patients were reviewed. Among these 37 patients, 5 patients were treated by surgery, while 29 patients were treated by the endovascular approach and 3 received conservative treatment. Results: During the study period, 42 pseudoaneurysms were identified in 37 patients with a history of head or neck injury. Five patients underwent surgical exploration of the lesion with an uneventful postoperative course. 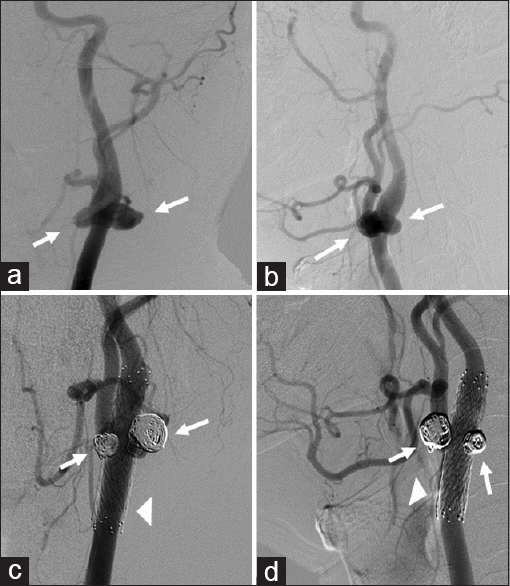 Twenty-nine patients were treated by endovascular interventions with various embolization materials including coils, stents, detachable balloons, liquid embolic agents, and a combination of these agents. The angiographic follow-up imaging demonstrated complete exclusion of the aneurysm from the circulation with the patient being free from any additional neurological deficits. Conclusion: Proper selection of an appropriate approach is essential to address the management of traumatic cervico-cerebral pseudoaneurysms. The treatment of traumatic cervico-cerebral pseudoaneurysms should be selected according to the location and the clinical features of the pseudoaneurysms. The endovascular treatment is a safe and effective modality and should be the first-line choice for treatment of traumatic pseudoaneurysms. Endovascular intervention is a safe and an effective option for the treatment of traumatic cervico-cerebral pseudoaneurysms. Microsurgical is useful for treating those pseudoaneurysms that are located superficially or present with a local mass effect due to an associated hematoma or an area of ischaemia. Aggressive management of traumatic intracranial pseudoaneurysms rather than conservative treatment is generally warranted to prevent life-threatening hemorrhage or thromboembolic phenomena from developing. Traumatic cervico-cranial or cerebral pseudoaneurysms are particularly rare and account for less than 1% of the reported aneurysms. They are usually associated with a history of blunt or penetrating trauma to the head and neck.,, Histologically, these lesions are not true aneurysms and the walls of these pseudoaneurysms are often fragile, making them particularly susceptible to rupture with a high rate of morbidity and mortality. Therefore, it is critical that traumatic cervico-cerebral pseudoaneurysms should be safely and completely excluded from the parent artery as early as possible, as there is a high risk of rebleeding from any remnants of the untreated pseudoaneurysms. Traditionally, these pseudoaneurysms have been treated by an open microsurgical intervention including clipping, wrapping or trapping, which have been associated with a high rate of intraoperative rupture, postoperative regrowth of the aneurysm and re-hemorrhage. In many cases, these lesions are usually fusiform and lack a saccular component, or the saccular component is too small to undergo successful clipping. Often the parent vessel must be sacrificed to achieve a desirable aneurysmal exclusion. When treated using the endovascular management strategies, several techniques have been described including coil embolization, bare-stent or double bare-stent placement with or without coil embolization, with varying degrees of immediate and short-term success.,,, However, the management of the majority of these lesions remains a challenge, both utilizing the surgical or endovascular interventional approaches. Thus, we report our limited experience on the various treatment options that were utilized to manage these lesions. A retrospective review was performed between September 2009 and December 2014 of all patients with the diagnosis of pseudoaneurysm at our institution. The study was approved by our institutional review board, and all patients involved in this study signed the informed consent. The patients included 30 male and 7 female patients, with an average age of 32.51 years (standard deviation [SD], 13.21 years; range, 6-63 years). All patients had a history of blunt or penetrating trauma to the head and neck; in 22 cases, the pseudoaneurysm developed secondary to a road traffic accident; in 7 cases, it was caused by an alleged assault; in 5 cases, it occurred after a fall; and, in the remaining 3 cases, it occurred after a stab injury. The initial clinical manifestations included subarachnoid hemorrhage and headache (n = 15), exophthalmos (n = 5), local swelling or a pulsatile hematoma (n = 6), epistaxis (n = 8), intracranial hematoma (n = 2), and intracranial murmur (n = 1). The demographic data, etiology, clinical presentation, lesion location, treatment modality, and follow-up outcomes of these patients are summarized in [Table 1]. All patients included in the study were subjected to a cranial computed tomography (CT) scan. The CT scan revealed fracture of the skull base in 11 patients. 34 patients underwent a cerebral angiography and 3 patients underwent a 320-row three-dimensional computed tomography angiogram (CTA). The angiogram revealed the shape, size and position of the pseudoaneurysm and its neck, the proximal end and distal end of the parent artery, as well as the primary blood supply and collateral circulation around the blood vessel harbouring the aneurysm. The indications for the various procedures adopted to treat these aneurysms depended on the location of the pseudoaneurysms, the size of the sac and neck, and the condition of the parent artery. Open surgical management was performed in the cases in whom the pseudoaneurysm occurred in a superficial location and/or was associated with a hematoma and local mass effect, and when the endovascular approaches failed to achieve their goal or were not feasible. The alternative methods of endovascular treatment that were adopted in the study included embolization of the parent artery, securing the sac of the pseudoaneurysms, and the implantation of a covered stent. Twenty-nine of the 37 patients were treated by various forms of endovascular interventions with different kinds of embolization material including coils, stents, detachable balloons, medical liquid embolic agents, and a combination of these agents [Table 1]. The follow-up examinations of the treated patients included a 320-row CTA and/or a conventional catheter angiogram, performed at 3 to 6 months and at 12 to 30 months after the procedure. Thirty-four patients had at least 1 control angiogram performed at least 3 months after undergoing the primary treatment for the pseudoaneurysm. Four patients had more than two cerebral angiograms during the follow-up duration. A neurologist or neurosurgeon performed a clinical assessment at the follow-up visit and at the time of the hospitalization that was required for the every follow-up angiographic procedure. Of the 42 evaluated pseudoaneurysms, 6 pseudoaneurysms were located on the extracranial segment of the internal carotid artery [Figure 1], [Figure 2], [Figure 3]; 25 on the intracranial segment of the internal carotid artery, including 2 located on its petrous segment, 3 on the ophthalmic segment, 11 on the supraclinoid segment, and 9 on the cavernous segment (among them were also included 5 patients who had a carotico-cavernous fistula in association with the pseudoaneurysm [Figure 4] and [Figure 5]; 3 on the anterior cerebral artery; 1 on the middle cerebral artery; 1 on the vertebral artery; 1 on the anterior inferior cerebellar artery; 3 on the superficial temporal artery; and, 2 on the sphenopalatine artery. These pseudoaneurysms measured from 2.0 mm × 3.8 mm to 20 mm × 15 mm. The time from sustaining the trauma to the first treatment offered for the pseudoaneurysm varied from 4 days to 8 years before the patients presented to our hospital. Two patients with superficial temporal artery pseudoaneurysms (case 1 and case 2) have been previously described by Cai et al. Surgical management was performed in 5 patients. These included a pseudoaneurysm present within the scalp in 3 patients; and, an intracranial pseudoaneurysm with an associated hematoma in 2 patients. Endovascular treatment was performed in 29 of the 37 patients. The endovascular procedures used included the aneurysmal sac embolization using the Guglielmi detachable coil in 4 patients; a stent-assisted coil embolization of the sac of the pseudoaneurysm in 6 patients; embolization of the parent artery or the pseudoaneurysm with 20% glubran or onyx, in one patient each; a detachable balloon occlusion of the internal carotid artery in 4 patients; and, the implantation of an endovascular Willis covered stent in 13 patients. 3 patients underwent conservative therapy as any kind of proposed intervention was rejected by their relatives for economical reasons. Five patients, who underwent surgical exploration of the lesion had an uneventful postoperative course with successful obliteration of the pseudoaneurysm. The findings on histologic examination of the surgical specimen in three patients were consistent with diagnosis of a pseudoaneurysm without the presence of a normal arterial architecture. The endovascular interventions performed in 29 patients were all technically successful. Serial angiograms performed at the end of the initial procedure showed complete occlusion of the pseudoaneurysm in 25 patients and near-complete occlusion of the pseudoaneurysm in 4 patients. All 34 patients underwent a cranial CT scan immediately after the procedure. At discharge, no adverse events were detectable such as rebleeding or ischemia. At a follow up visit between 6 and 18 months, the 5 patients who had undergone the open surgical procedure were doing very well without any evidence of pseudoaneurysm recurrence or the development of a permanent morbidity. There were no deaths or fresh neurological complaints relating to the surgical treatment. Serial angiograms of the 29 patients who underwent an endovascular intervention performed at a follow up period of between 3 to 6-months demonstrated that one patient showed the asymptomatic recurrence of the pseudoaneurysm, and her family refused any further treatment. Rest of the 28 patients showed complete exclusion of their pseudoaneurysm from the circulation and none of them had an additional neurological deficit. The resolution of symptoms in these patients following their treatment occurred at variable times ranging from 2 weeks to 3 months. At the 12 to 24-month follow-up visit, both the single patient with asymptomatic recurrence of the pseudoaneurysm and the other 28 patients with complete obliteration of the pseudoaneurysm were stable, without any of them developing an in-stent stenosis. Four patients who have had more than two cerebral angiographic studies at follow-up visits were stable without any neurological complaints. Among the 3 patients who underwent conservative treatment, 2 patients died of the pseudoaneurysmal rebleeding; and, in the third patient who underwent conservative therapy, the pseudoaneurysm resolved after its spontaneous occlusion, as was evident on the DSA reperformed 22 days after the first DSA examination. This spontaneous resolution of a pseudoaneurysm has not been previously reported in the literature. At the most recent follow-up performed by a telephonic interview, there was no occurrence of rebleeding or ischemic events in both the surgical and the endovascular treated groups. Traumatic intracranial pseudoaneurysms are rare and account for less than 0.4 percent of all intracranial aneurysms., The recognized etiology of pseudoaneurysms includes trauma, iatrogenic injury, infection, vasculitis, and inflammatory condition. The majority of these aneurysms arise at the skull base or in the distal anterior and middle cerebral arteries or their branches, following direct vessel wall injury or following the blood vessel being subjected to an acceleration-induced shearing force. A skull base fracture is likely to injure the arteries near the cranial base and give rise to a pseudoaneurysm of the internal carotid artery (ICA) in the cavernous sinus, or of its clinoidal or supraclinoid segment, which are the main locations of traumatic intracranial pseudoaneurysms. Traumatic intracranial pseudoaneurysms rarely undergo spontaneously regression, and they have a high propensity to spontaneously undergo rebleeding within approximately 3 weeks, often before appropriate treatment may be instituted. These aneurysms have a poor prognosis if not diagnosed correctly and promptly treated. The mortality rates in patients harbouring a traumatic intracranial pseudoaneurysm that was not aggressively treated have varied from 32% to 50%., Thus, the primary goals in the treatment of traumatic intracranial pseudoaneurysms are establishing an early diagnosis and instituting an appropriate treatment strategy to prevent rebleeding or ischemic complications. 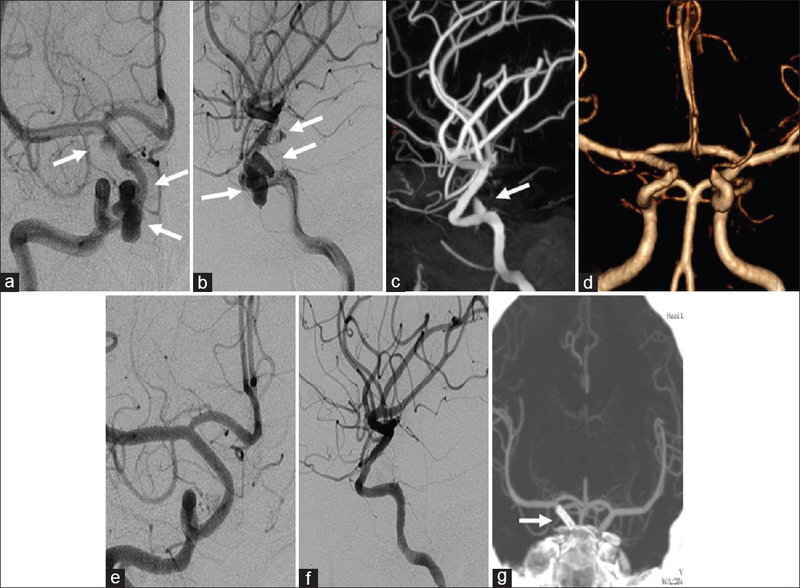 Although multiple imaging techniques can relatively easily establish the presence of a pseudoaneurysm, including a magnetic resonance (MR) imaging angiography (MRA) and a CTA, DSA remains the gold standard for the detection of intracranial aneurysms. The optimal treatment involves complete pseudoaneurysmal exclusion from the circulation by means of surgical trapping or endovascular obliteration, as soon as possible. The selection of the suitable cases for the various treatment options available has become a crucial point in the management of pseudoaneurysms. Surgical options for treating pseudoaneurysms consist of direct clipping, wrapping, trapping, ligation of the carotid artery, and bypass for those patients in whom balloon occlusion test (BOT) is not well tolerated. Typically, these pseudoaneurysms are composed of only fibrous tissue and do not contain normal vessel wall elements. Therefore, open surgical clipping of these aneurysms may not be a viable option because they commonly have a fragile wall and usually do not have a neck feasible for clipping. These characteristics may be responsible for the higher rates of intraoperative rupture of pseudoaneurysms, in case surgical clipping is attempted.,, In our series, direct microsurgical management was performed in the cases in whom the pseudoaneurysm involved the scalp, or was associated with an intracerebral hematoma and local mass effect. Recent reports of endovascular treatment of traumatic intracranial pseudoaneurysms have shown promising results., These methods may include either sacrifice or preservation of the parent artery. The main materials used in the endoluminal treatment of pseudoaneurysms include coils, detachable balloons, medical liquid embolic agents, stents, and a combination of two or three materials. In fact, the placement of coils into the lumen of these aneurysms that have an extremely fragile wall is a potentially dangerous maneuver and may cause perforation of the aneurysm and rebleeding. Recently, several studies have indicated that the clinical outcome is better in patients who are treated by sacrifice of the parent artery and that these patients have a lower rate of complications., Moreover, parent vessel occlusion is a relatively simple procedure to perform. If BOT is well tolerated, then parent artery occlusion is an alternative option for treatment of traumatic intracranial pseudoaneurysms. In the present study, we used detachable balloons alone to successfully occlude the pseudoaneurysms and the associated arteriovenous fistulae in four patients harbouring a traumatic pseudoaneurysm of the internal carotid artery. These patients had the pseudoaneurysm along with the presence of a traumatic carotid cavernous fistula (TCCF). No complications or any other adverse vascular events were encountered following this procedure and none of the patients experienced a recurrence that could be detectable during the clinical and radiological assessment performed at follow-up visits. However, ischemic complications, including a cerebral infarct may occur after occlusion of the parent artery in 5% to 22% of patients in whom parent artery occlusion has been performed, despite their having a normal BOT. During the acute periods of subarachnoid hemorrhage, dual anti-platelet agents may pose the danger of an additional intracerebral hemorrhage occurring in the patients before or after the endovacular stenting procedure; however, in patients undergoing a stent, and with a peri- or post-procedural and long-term follow-up in our study as well as several others, there were no episodes of significant rebleeding related to the initial administration of dual anti-platelet therapy.,,, Furthermore, a more recent and larger series reported that 29 endovascular procedures were performed with only 2 long-term complications; once again, both patients who had complications had not received antiplatelet medications. In our institution, we have been able to avoid placement of the stent in patients who have either not received or cannot receive appropriate pre- or post-procedural antiplatelet therapy. On the other hand, thromboembolism or an instant ICA stenosis, and ICA occlusion could be closely associated with permanent morbidity or mortality. Antiplatelet therapy is an important treatment strategy when these covered stents are used. In our practice, we focused on avoiding the ischemic complications by giving anti-platelet agents after placement of an intraarterial stent by an endovascular procedure. A loading dose of 300 mg clopidogrel was given immediately by the nasogastric tube once, right before the procedure. The patients also received a bolus of 5000 IU heparin at the start of the procedure, followed by a continuous infusion of 1000 IU/h, with the aim of keeping the activated clotting time above 300 second (normal value: 80-160 seconds). Heparin was given for 24 hours after the procedure, and the patients were instructed to take aspirin (100 mg/day) and clopidogrel (75 mg/day) orally for 6 months to avoid thrombosis and stenosis in the area of the covered stent segment, and aspirin regimen was recommended to be continued indefinitely. At our institution, we neither observed any peri-procedural and long-term complications nor any mortality related to stent placement; we also did not observe any rebleeding episodes or ischemic events during the follow-up period. Only one patient experienced an asymptomatic recurrence of his pseudoaneurysm but the family refused to undertake any additional treatment for addressing it. In our study, among the 3 patients who underwent conservative treatment, 2 patients died of pseudoaneurysmal rebleeding. In one other patient, the traumatic pseudoaneurysm of the right supraclinoid ICA self-occluded with the parent artery being fully patent, as revealed by the DSA re-performed 22 days after the first DSA examination. This phenomenon has not been previously reported in the literature. Therefore, a ruptured intracranial traumatic pseudoaneurysm should be aggressively managed. To the best of our knowledge, this report represents the largest published case series reviewing the various strategies available for the treatment for traumatic cervico-cranial pseudoaneurysms. The conclusions drawn from our limited experience and a comprehensive review of the literature include the following: (1) Although the optimal treatment for traumatic cervico-cerebral pseudoaneurysms remains controversial, our study adds to the previously published data demonstrating that endovascular intervention is a safe and an effective option for the treatment of traumatic cervico-cerebral pseudoaneurysms. Regarding the choice of selection of the optimal embolisation material, we recommend that a covered stent should be the first treatment option, whenever possible. Although the placement of coils into the traumatic pseudoaneurysmal sac is a potentially dangerous maneuver and may cause wall perforation and rebleeding, coiling with or without adjunctive stenting is an appropriate alternative method of treatment in selected cases. Detachable balloons and other endovascular arterial occlusion materials are reserved as the last resort when parent vessel embolisation is the only feasible option. In addition, dual antiplatelet treatment seems to be advantageous after the stent placement. (2) Despite the growing popularity of endoluminal management of pseudoaneurysms, we maintain that direct microsurgical management has an important role to play in the management of pseudoaneurysms that are located superficially or present with a local mass effect due to associated features such as a hematoma or an area of ischaemia. (3) Despite the lack of convincing evidence, aggressive management of traumatic intracranial pseudoaneurysms rather than conservative treatment is generally warranted to prevent life-threatening hemorrhage or thromboembolic phenomena from developing. Multimodality randomized controlled studies are difficult to perform for this entity. In our limited experience, the proper selection of suitable cases for the various treatment strategies has become the crucial point in the treatment of traumatic intracranial pseudoaneurysms. A reasonably “tailored” treatment strategy individualized for the particular patient is particularly essential for obtaining an excellent prognosis. The study was approved by the Ethics Review Board of Wuhan General Hospital. This work was supported by the National Natural Science Foundation of China (Grant NO. 81220108007 and 11272132). Holmes B, Harbaugh RE. Traumatic intracranial aneurysms: A contemporary review. J Trauma 1993;35:855-60. Kumar RJ, Sundaram PK, Gunjkar JD. Traumatic giant pseudo-aneurysm of the middle meningeal artery causing intracerebral hematoma. Neurol India 2011;59:921-2. Cai MJ, Yang M, Ma LT, Pan L, Xu GZ, Li J, et al. Traumatic pseudoaneurysm of the superficial temporal artery. Am Surg 2013;79:E127-9. Pulli R, Dorigo W, Pratesi G, Fargion A, Pratesi C. Single-center experience on endovascular repair of noninfected extracranial internal carotid artery pseudoaneurysms. Ann Vasc Surg 2013;27:e13-7. Lim YC, Kang JK, Chung J. Reconstructive stent-buttressed coil embolization of a traumatic pseudoaneurysm of the supraclinoid internal carotid artery. Acta Neurochir (Wien) 2012;154:477-80. Honda M, Anda T, Ishihara T. Ruptured pseudoaneurysm of the superficial temporal artery after craniotomy. Neurol India 2013;61:698-9. Hori Y, Kiyosue H, Kashiwagi J, Asano T, Shuto R, Matsumoto Y, et al. Double stent technique for the treatment of an internal carotid artery pseudoaneurysm caused by zone III stab injury. J Vasc Interv Radiol 2007;18:1300-4. Leal FS, Miranda CC, Guimarães AC. Traumatic pseudoaneurysm of the superficial temporal artery: Case report. Arq Neuropsiquiatr 2005;63:859-61. Klein GE, Szolar DH, Raith J, Frühwirth H, Pascher O, Hausegger KA. 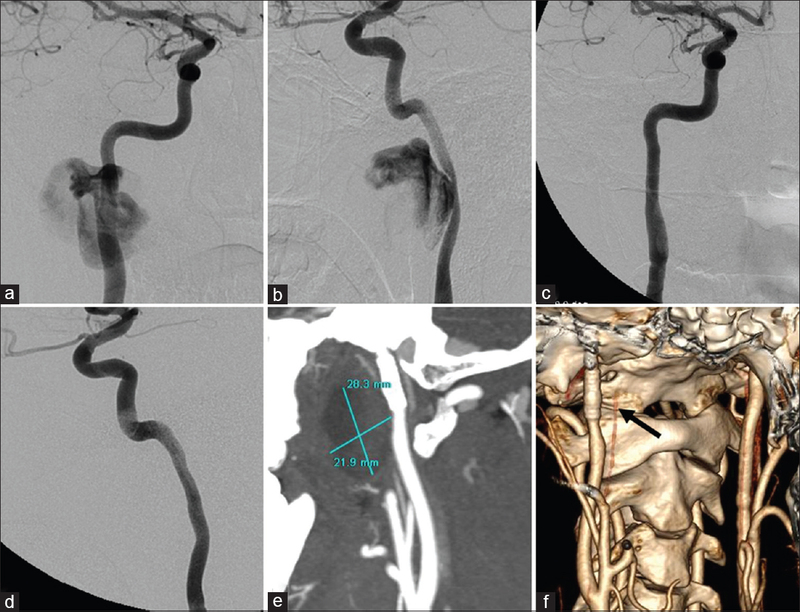 Posttraumatic extracranial aneurysm of the internal carotid artery: Combined endovascular treatment with coils and stents. AJNR Am J Neuroradiol 1997;18:1261-4. Maras D, Lioupis C, Magoufis G, Tsamopoulos N, Moulakakis K, Andrikopoulos V. Covered stent-graft treatment of traumatic internal carotid artery pseudoaneurysms: A review. Cardiovasc Intervent Radiol 2006;29:958-68. Larson PS, Reisner A, Morassutti DJ, Abdulhadi B, Harpring JE. Traumatic intracranial aneurysms. Neurosurg Focus 2000;8:e4. Cohen JE, Gomori JM, Segal R, Spivak A, Margolin E, Sviri G, et al. Results of endovascular treatment of traumatic intracranial aneurysms. Neurosurgery 2008;63:476-86. Mao Z, Wang N, Hussain M, Li M, Zhang H, Zhang Q, et al. Traumatic intracranial aneurysms due to blunt brain injury-a single center experience. Acta Neurochir (Wien) 2012;154:2187-93. Bell RS, Vo AH, Roberts R, Wanebo J, Armonda RA. 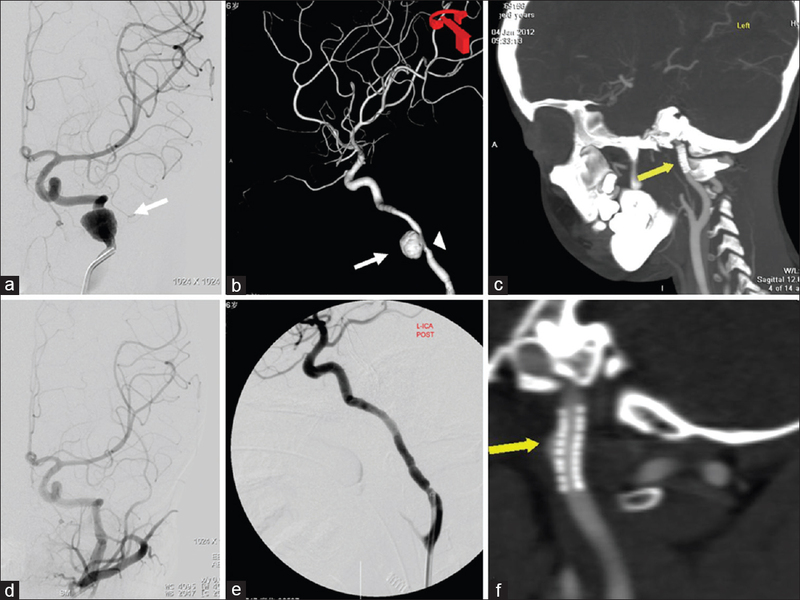 Wartime traumatic aneurysms: Acute presentation, diagnosis, and multimodal treatment of 64 craniocervical artery injuries. Neurosurgery 2010;66:66-79. Saatci I, Cekirge HS, Ozturk MH, Arat A, Ergungor F, Sekerci Z, et al. Treatment of internal carotid artery aneurysms with a covered stent: Experience in 24 patients with mid-term follow-up results. AJNR Am J Neuroradiol 2004;25:1742-9.
van der Schaaf IC, Brilstra EH, Buskens E, Rinkel GJ. 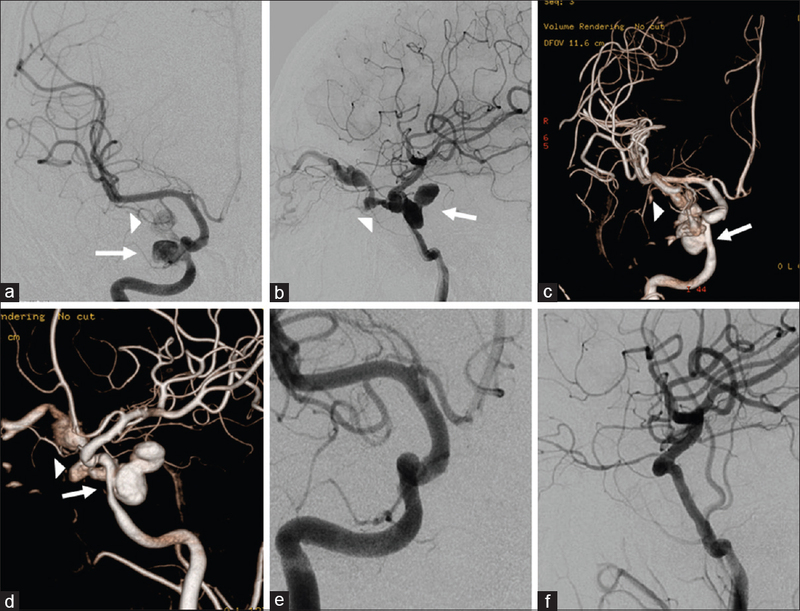 Endovascular treatment of aneurysms in the cavernous sinus: A systematic review on balloon occlusion of the parent vessel and embolization with coils. Stroke 2002;33:313-8. Li MH, Li YD, Gao BL, Fang C, Luo QY, Cheng YS, et al. A new covered stent designed for intracranial vasculature: Application in the management of pseudoaneurysms of the cranial internal carotid artery. AJNR Am J Neuroradiol 2007;28:1579-85. Eckert B, Thie A, Carvajal M, Groden C, Zeumer H. Predicting hemodynamic ischemia by transcranial Doppler monitoring during therapeutic balloon occlusion of the internal carotid artery. AJNR Am J Neuroradiol 1998;19:577-82. Tan HQ, Li MH, Zhang PL, Li YD, Wang JB, Zhu YQ, et al. Reconstructive endovascular treatment of intracranial aneurysms with the Willis covered stent: Medium-term clinical and angiographic follow-up. J Neurosurg 2011;114:1014-20. Wang W, Li MH, Li YD, Gu BX, Wang J, Zhang PL, et al. Treatment of traumatic internal carotid artery pseudoaneurysms with the Willis covered stent: A prospective study. J Trauma 2011;70:816-22. Li MH, Li YD, Tan HQ, Luo QY, Cheng YS. Treatment of distal internal carotid artery aneurysm with the Willis covered stent: A prospective pilot study. Radiology 2009;253:470-7. Li MH, Zhu YQ, Fang C, Wang W, Zhang PL, Cheng YS, et al. The feasibility and efficacy of treatment with a Willis covered stent in recurrent intracranial aneurysms after coiling. AJNR Am J Neuroradiol 2008;29:1395-400. Kumar A, Ahuja CK, Khandelwal N, Mathuriya SN. Endovascular N-Butyl cyanoacrylate glue embolization of traumatic anterior cerebral artery pseudo-aneurysm. Neurol India 2012;60:663-5. Kadkhodayan Y, Jeck DT, Moran CJ, Derdeyn CP, Cross DT 3rd. Angioplasty and stenting in carotid dissection with or without associated pseudoaneurysm. AJNR Am J Neuroradiol 2005;26:2328-35. Chen YA, Hussain M, Zhang JY, Zhang KP, Pang Q. Stent-assisted coiling of cerebral aneurysms using the Enterprise and the Solitaire devices. Neurol Res 2014;36:461-7.